CHATTANOOGA,Tenn. (Oct. 24, 2018) – Chattanooga Red Wolves SC has inked Irish forward Éamon Zayed to its USL League One team. The USL standout will join the franchise in 2019 from the Charlotte Independence, pending league and federation approval. As a prolific forward for the Independence’s offense, Zayed played an essential role in the team’s success, tallying eight goals and two assists during the 2018 regular season. 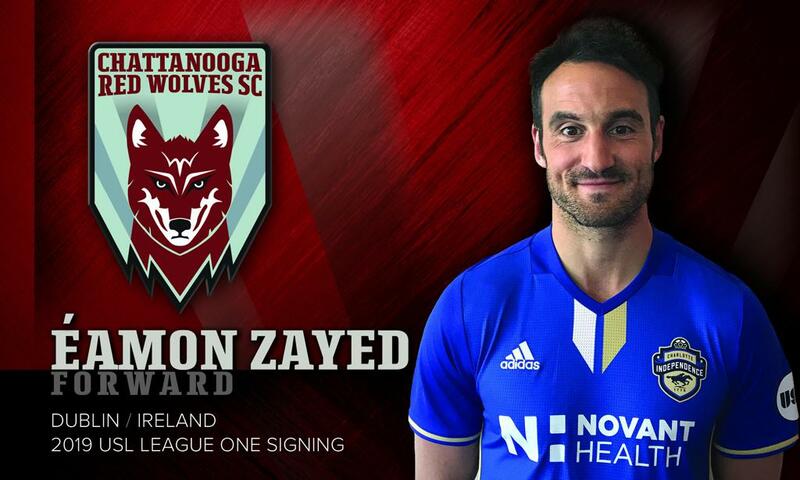 According to Tim Hankinson, head coach and technical director for Chattanooga Red Wolves SC, Zayed makes an impressive addition to the Red Wolves roster. Prior to joining the Independence, Zayed spent two seasons with Indy Eleven in the NASL, playing under Hankinson. Eamon was the only player in the league to register double-digit goals in consecutive seasons, earning him a spot on the 2016 NASL Best XI and MVP nominations in both the 2016 and 2017 seasons. He left Indy as the club’s leading goal scorer, and that accolade still stands today as he finished with 27 goals and nine assists in 60 games.